A few weeks ago, my husband and I took a weekend trip to Asheville, NC. Our main purpose for the trip was to attend a Reiki TUMMO training. The training itself was illuminating and informative, and I would highly recommend it to anyone interested in energy healing for yourself and for others. However, since we were in town, we knew we had to take advantage of the amazing vegan food that Asheville has to offer. The first place we went to was Gan Shan West. Gan Shan West is an outpost location while Gan Shan Station is the flagship restaurant, also located in Asheville. Gan Shan West is smaller and more noodle-centric, and we were intrigued by their ramen selection. The East Asian style food is influenced by the cuisines of China, Vietnam, Japan, Laos, Thailand, and Singapore. My husband and I both ordered the Vegetable Ramen, which came with marinated tofu, roasted carrots, roasted mushrooms, bok choy, pickled onions, and scallions, served with a wide chewy noodle. The broth was brimming with umami flavor, and the roasted vegetables added a layer of depth to the dish that brought everything together. I also ordered a steamed bun with seitan (not pictured) that combined a plethora of amazing textures and flavors. Overall, we were very satisfied with Gan Shan’s interpretation of Asian flavors and impressed with their commitment to local and seasonal ingredients. That night, we went to dinner at Rosetta’s Kitchen, which is known for their vegetarian and vegan soul food. Rosetta’s has been open since 2002 and their mission is nourish, through “offering creative flavorful foods made of fresh whole foods, with a focus on local, seasonal selections, and honest open ingredient integrity.” Another great perk of Rosetta’s Kitchen is their partnership with Buchi, a kombucha company located in nearby Marshall, NC. 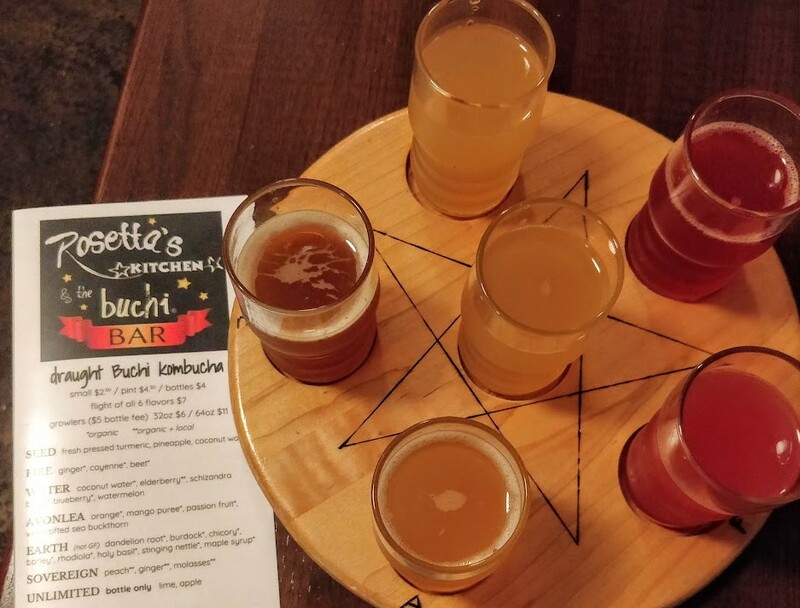 I’m not a a fan of beer, so I was ecstatic when I saw the flight of six different kombucha flavors on the menu. Finally, a flight I can enjoy! I thoroughly enjoyed five out of the six flavors. Not bad at all! The kombuchas were a perfect balance of slightly sweet and tangy, enhanced by the subtle flavors of fruit, spices, and other intriguing additions. For appetizer, we ordered the Chili Cheese Fries, which is a huge mound of crispy fries, vegan chili, and Daiya cheese. This was a great vegan version of a comfort food classic. 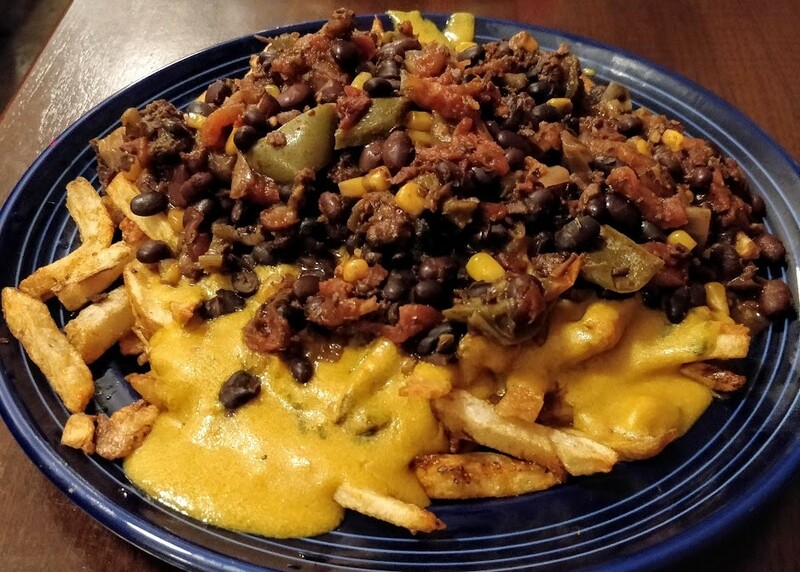 Neither of us had eaten chili cheese fries since becoming vegan, and this indulgent dish really hit the spot. The cheese was slightly runnier than a normal cheese sauce but still very tasty. I loved that the generous helping of chili in the dish contained so many great ingredients, including bell peppers and corn. My husband ordered the Tempeh Reuben, which consisted of local marinated hempeh (made from hemp protein), house-cultured sauerkraut, and an herb-walnut sauce, wedged between two slices of rye focaccia. He decided to switch out the cheese and added avocado instead. He really enjoyed how the various components of the sandwich came together but indicated that it was a little bland. After dinner and a visit to Downtown Books & News, a quirky used bookstore, we paid a visit to The Hop Ice Cream Cafe. 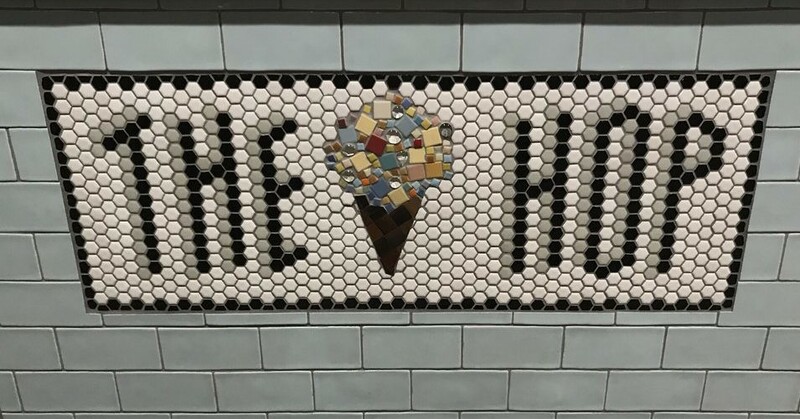 They serve homemade dairy ice cream, vegan ice cream, coffee, and desserts. Each vegan ice cream flavor is labeled with the type of non-dairy milk it is made of, such as coconut, hemp, oat, and almond. The flavors are unique and exotic, quite different from typical ones you would be able to find at a grocery store. 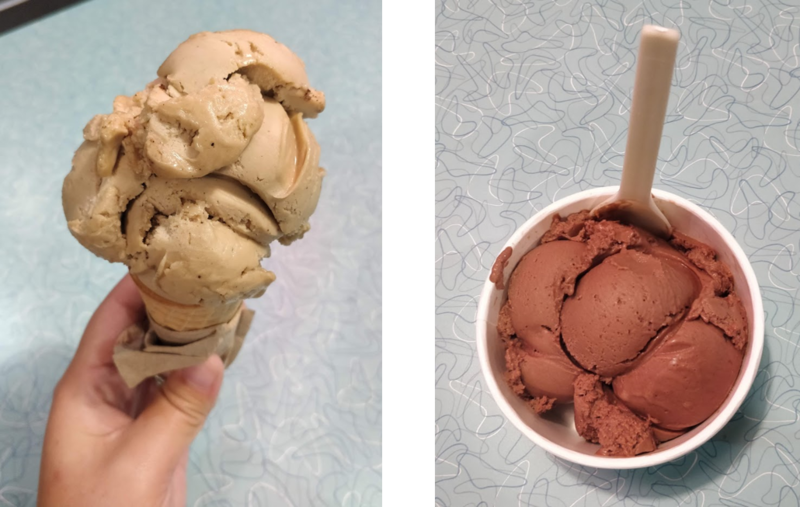 I opted for a scoop of caramel latte hemp milk on a sugar cone, and my husband got two scoops of the chocolate CBD hemp milk flavor. The flavors packed a punch but not overpowering. And both flavors had a decadent creamy texture, even though non-dairy milk was used. It was the perfect ending to a fantastic night! 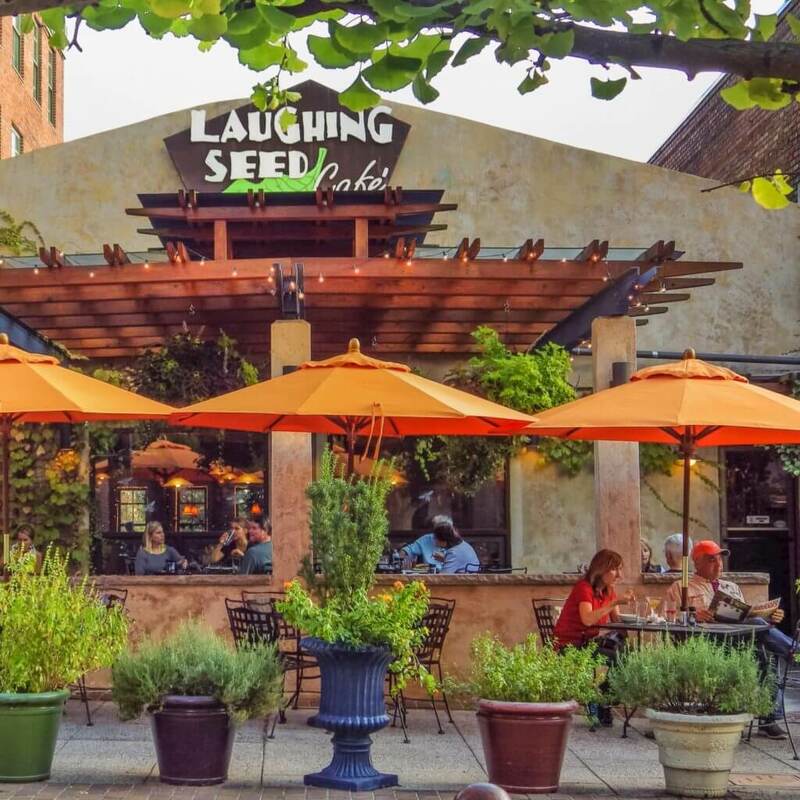 For our last day in Asheville, we chose to get lunch at The Laughing Seed Cafe. Their decor is fun and casual, with lots of natural light streaming into the restaurant. Their mission is to provide organic, local, and farm-to-table vegetarian cuisine with an international flair. We got there just in time for Sunday Brunch, which offers a slightly different menu. To start, we ordered the Hummus Trio, which comes with roasted garlic, spicy black bean, and seasonal vegetable hummus. It’s served with a house-made whole wheat pita and crudité. All three hummuses were delicious and packed with flavor, but our favorite was the spicy black bean. The pitas were pillowy soft and a perfect accompaniment to the dish. For the entree, I went for the classic comfort food brunch option, and my husband opted for a healthier but still tasty choice. I ordered the Blue Plate, which comes with organic scrambled tofu, biscuits and gravy, smoky potatoes, seitan sausage, and a kale pickled onion salad. The potatoes were crispy, and the tofu scramble was well-seasoned. The seitan sausage was a little dry and crumbly but had a nice flavor. The kale salad was light, and the pickled onions were tangy paired nicely with the kale. But my favorite part was definitely the biscuits and gravy. The biscuit was soft and fluffy, and the gravy was creamy and rich. This vegan meal was extremely satisfying and could even be enjoyed by omnivores. My husband picked the Harmony Bowl, which is a multilayer bowl of brown rice, black beans, and steamed vegetables, topped with grilled and marinated tofu. A sesame-ginger dressing comes on the side, which gives the dish a great flavor profile. Asheville is hard city to top when it comes to providing a wide selection of delicious food for plant-based diets. We loved not having to make any adjustments or substitutions to accommodate our dietary restrictions. 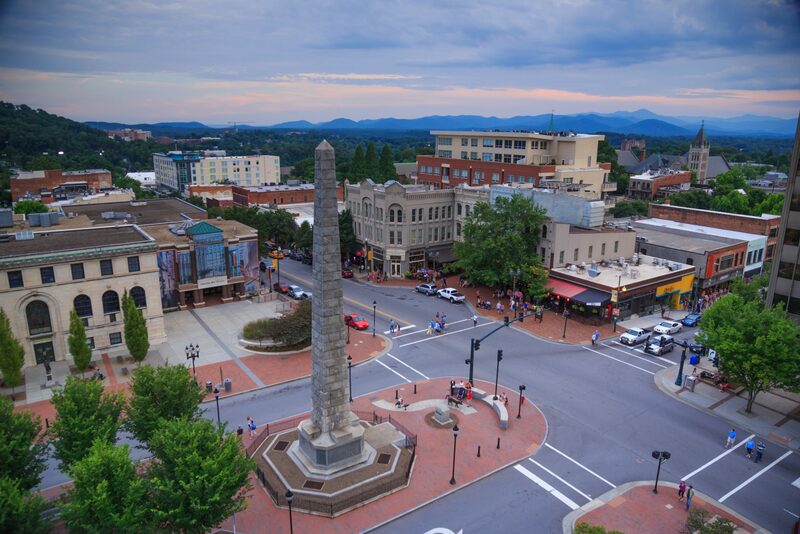 Since we were only there for two days, I’m sure we only scratched the surface of all the great food Asheville has to offer. We are planning to visit again soon. Omg everything looks so yummy! You didn’t have your own kitchen before? I’m sure this will be a nice change for you. Cooking at home gives you the ultimate freedom!